We always end up with leftover ham after Easter. I think it’s mostly because my Mom, my Grandma and I always end up qualifying for the free holiday ham at the grocery store – and then make it a challenge to see who can get the biggest one for free. Of course, the hams are always bigger than we need – and we’ll only make one of the three for Easter. So, there will be a lot of ham in this family in the next few weeks. This is a great way to use some of it up. These are generally through of as more of an appetizer or party food, but paired with a salad they’re a quick, easy dinner. Split slider rolls and spread them with mayonnaise. Top with ham and cheese and cover. Place them on a baking sheet. In a small bowl, whisk together the mustard, melted butter, onion and Worcestershire sauce. Pour sauce evenly over the tops of the sliders. 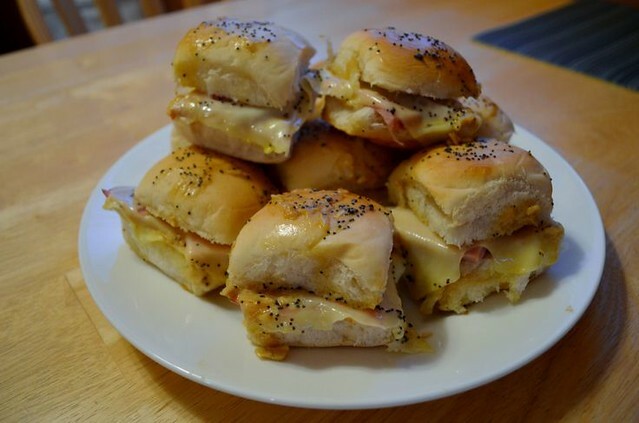 Sprinkle sliders with poppy seeds. Cover the sandwiches with foil and bake for 10 minutes. Remove foil and bake 2 minutes longer. Serve warm.